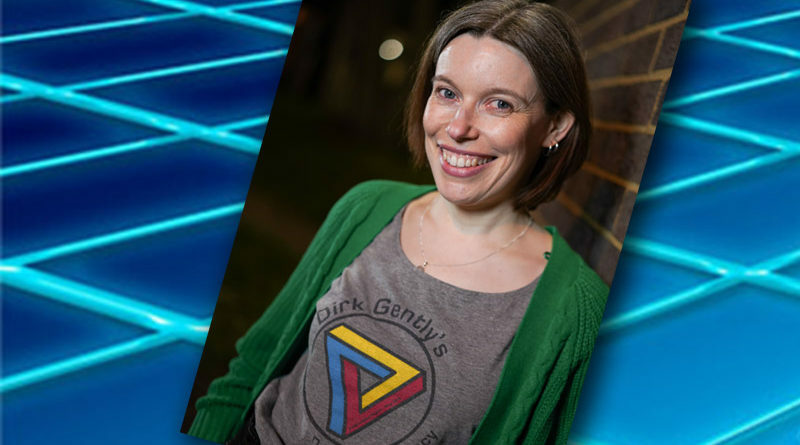 Our newsletter editor interviewed me recently regarding my current role as Director for Dirk Gently’s Holistic Detective Agency. With just over a month till curtain up, and rehearsals in full swing, we thought we’d share it with you. What made you choose a Douglas Adams play? I LOVE Douglas Adams. Ever since my Dad introduced me to Hitchhikers Guide when I was a child, I have loved his books and the screen and radio spin-offs of his work. I love the absurdity of his humour, and the characters he has created. Who can forget Slartibartfast and his pride in creating the fjords of Norway? Or Marvin the paranoid android. It’s pure escapism and joy that can fit in your pocket in a handy little paper back (digital downloads are also available…). I’m a bit of an obsessive reader, and there is nothing better than having a Douglas Adams book with you at all times that you can whip out while you are eating, or waiting for train, to while away the dreariness of everyday life. His work is certainly “different”, so how will you stage Dirk Gently. Special effects? Well, when I proposed to the board that I would like to direct this play, I admit I hadn’t thought a great deal about how to achieve the special effects involved, and trusted in the creativity of the group to step up and help. Within minutes of announcing the season, Ron emailed me and asked if I would like him to design the set and lighting and sound, and that he was also a huge Douglas Adams fan. Ron has put a lot of thought and hard work into the set and the special effects, and has made it very easy for me to do my job. Carl has also been instrumental in helping by taking some amazing publicity photos, and some other shots that will be used on the screen on stage. This piece has a large number of characters…….how did you manage to cast so many parts? I won’t lie – I thought it was a bit of a risk proposing this play and was seriously worried that Ron and I might be the only fans in the society and that no-one would turn up, but I was pleasantly surprised by the turn out at the auditions and was easily able to cast it all! We had a but of a rocky time having to re-cast some of the lead roles, but my faith in the interconnectiveness of all things paid off and things have come together to give me a fab cast who are all throwing themselves into their parts with abandon (t’s not a subtle piece, in case you hadn’t guessed). Dirk himself, is a very “wordy” role. Tell us about the actor portraying him, and the other lead parts. The supporting cast are equally fabulous, and too numerous to mention – but all of them have impressed me at rehearsals so far by turning up having brought something special to their characters. I am really looking forward to seeing how the play develops. Who are your backstage team? I’ve already mentioned Ron and Carl, and I have Sue as my uber-reliable and unflappable SM, keeping me in sanity and biscuits. Sophie has been enjoying herself (a little too much I suspect), costuming the cast already for our recent photoshoot, and Carolyne has taken on the challenge of furnishing us with props. Becs is my production co-ordinator and shoulder to lean on when I need a friend to lend an ear, Cat is on hand for make up on the nights and Brian will be my FOH manager. I mustn’t forget Phil Bassett who has done a sterling job already with the uber-eye catching poster and is coming up with something special for the programmes. Dream team I reckon! Sally Anne, you had a large role in Little Women, a crucial role in panto…..and now straight in to direct a challenging play. Why? It’s nothing short of an addiction I am afraid. My name is Sally-Anne and I am an Am-Dramaholic. Or should I say KLP-aholic? I am the sort of person who always needs a creative project to keep me amused, but the KLP is so much more than that. It’s friendship, creativity, fun, challenges, community and put simply, the icing on the cake. Tell us why we should all rush to book tickets. If you can answer yes to the following questions then you MUST come and see this show…. Do you like theatre? Do you like to laugh? Do you like any of the following… Douglas Adams, pizza, cats, aliens, Samuel Taylor Coleridge? And erm, do you know someone in the show? Come and see it!!! And bring all your friends – you won’t regret it. Copyright © 2019 Kings Langley Players. All rights reserved.